HUGE NEWS!!! ♥ My Story, My Grief, and My NEW YOUTUBE CHANNEL!! For a long time, I had a dream of having my own YouTube channel. The problem, however, was that I am a very shy person and I don’t like to be on film. I have no problem taking pictures of myself (as you know if you follow me on Instagram, lol) or with public speaking. I love watching Vine videos but was always too scared to turn the camera on myself and make one of my own, even with the low stakes of 6-seconds and virtually no audience. I watch a lot of YouTube videos and always wanted to be apart of that community- to be friends with those girls, to have people to talk about makeup with, to share my thoughts and feelings on all different subjects. I just couldn’t make it happen. In my heart I knew it was something I needed to do, but the fear was stronger. But then I figured, who cares? If someone who I never talk to or see knows that I am obsessed with Nars products this month, what does that matter? If someone comments something cruel, is that any worse than what I’ve been through? Plus, people just do not care the way your inner voice worries that they might. Everyone is WAY too busy with their own lives! That is a quote that I live by. Read it again, and think about it. It took me a very long time to understand that quote, and it REALLY pissed me off when I first heard it in a motivational video last year. My feelings felt valid, and my reasons for them felt valid, too! Yet I realized… when it comes to fear, or any feeling holding me back, I have to remember that there isn’t anything real at the end of that. This notion has helped me overcome things that I thought would plague me the rest of my days, things I truly believed would be impossible to get past in my personal and emotional life. I started a Google/Gmail/YouTube account with the name I wanted (Taylor Dorothy, of course) and then let it sit. 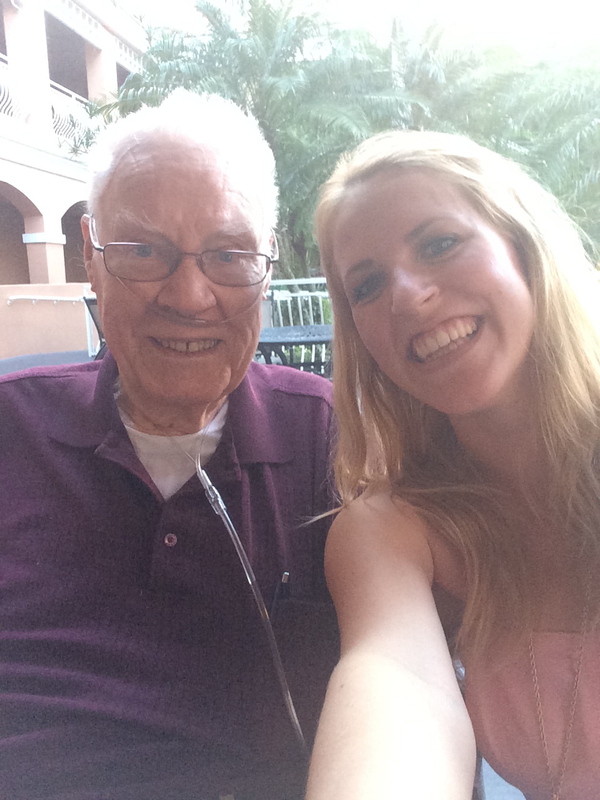 Then last week, my best friend in the world, my grandfather- I called him Poppy– passed on in his sleep. I decided there was no more time to waste. This is my one life. Knowing that my greatest champion and truest friend would have supported me through this, as well, I set up a stack of books and used my iphone and filmed my first YouTube video. Scott, who is a lot like my grandfather, helped teach me how to edit in iMovie. It took many tries, and several days, but I finally put my first video up on my channel. I didn’t know how to make a YouTube banner. I didn’t know how to edit at ALL. At first, I didn’t know how to export it without the video looking awful. It’s all a learning experience. But I’m doing it!! You can go watch my first video HERE. Right now, I am still in the grieving process. I probably will be for a very, very long time. I can’t believe that I don’t get to talk to my Poppy anymore. I am relieved that he isn’t suffering anymore. I am relieved that he went so peacefully. And in my own life, one thing that helps me is remembering I have new people to talk to now- everyone who watches my videos. I’m talking to you. Life is always changing and evolving. And that’s important. Here is a “selfie” we took together when I visited him in October, on a weekend trip during my last semester of college. So go hug your best friend, call your loved ones, and figure out what your dream is! Don’t let fear hold you back.